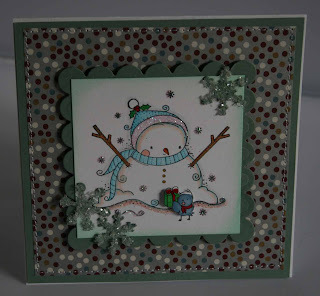 Well as you can see I have been busy making cards on my days off. 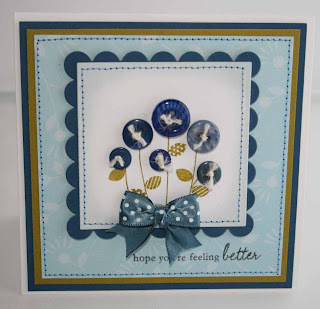 More so than normal cause I am listening to Diana Gabaldon's 4th book and it's excellent I can't stop listening to thought might as well make some cards while I am at it LOL.... Another one of Mo's designs.. All leafs are 3d. 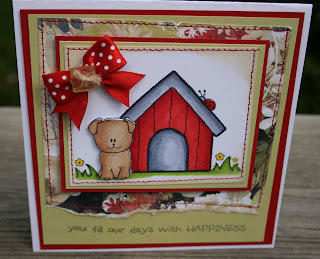 Here is this week's Soft Pencil weekly card challenge. Ths week was suppose to be Distressing - ripping, crumpling, inking. Well if you seen my cards I don't like crumpling and ripping LOL. But I played nice and did the background by doing what we were suppose to and then nice and neat on top LOL. 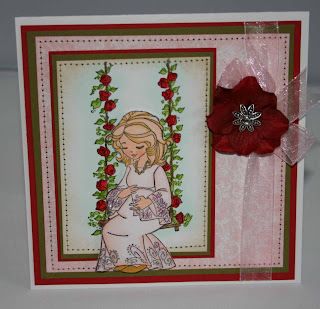 I have never gotten into the vintage type looking cards for me to do. Next week is Buttons and Bows. I already have mine done as we got our image already and you are gonna love it turned out cute but can't post that till next week.... I do however have some more of Mo's Digital pencil to show you later. 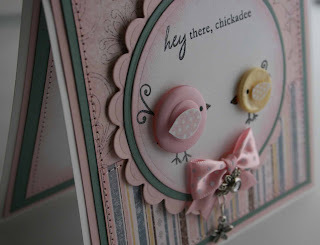 Here is another adorable image which can be found at Mo's Digital Images on Etsy... Colored with Pencils and OMS.. isn't she too cute. 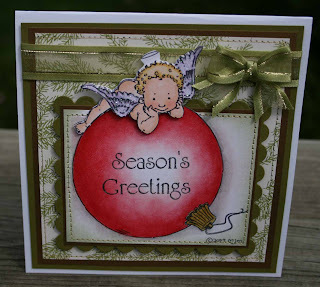 Well just walking out the door but thought I would post a card real quick. 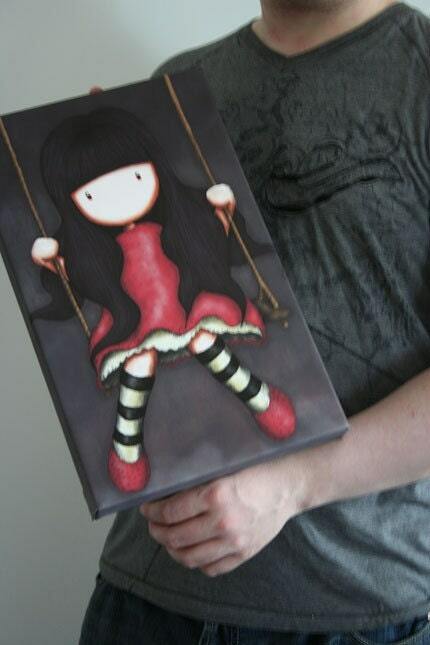 This is one of Taylored Expressions which was on sale a couple weeks ago. I added little glitter bumps for the candy. On another note I found another Digital stamp company last night blog hopping. It's on Etsy and called Mo's Digital Pencil - If you haven't been there you just have to see the detail on these images. I got a couple last night so will be making them this week... Have a great night..
Well good news Elizabeth is working around my schedule so I will be staying in the Soft Pencil Design Team. The Challenge or them for our cards this week was "Paper Piecing" which for digital I thought it would be challenging since I had no clue how I was going to do this but it was quite simple actually. Basically what I did was printed our my images before hand on a generic piece of paper so I could see where the image was going to land. Then I took my 2 different pieces of patterned paper and taped them on my good piece of cardstock where I haven't printed yet. I then printed it out again. 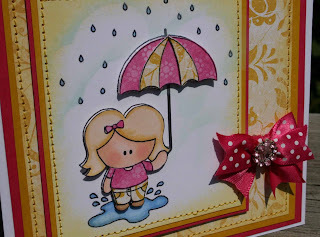 The paper I used was this year's Stampin Up designs I love it. Then I pieced the clothes and the umbrella and colored the rest with copics. Very simple.... Have a great day. Here is another card I made using the Whiff of Joy last release I think it was. Colored with copics. 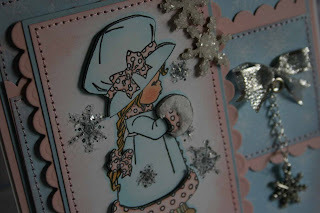 I just love these stamps they are so gorgeous. On another note if you haven't noticed I resigned from Victoria Case and also the short lived DT of Soft Pencil. Working nights I only have Thursday's and sometimes part of Friday if I don't have to drive my son to his dad's house so not enough hours in the day as it is. I had to graciously back out because I didn't have the time. 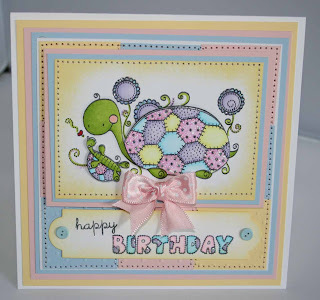 But on the brighter side today is Thursday so I will have some new cards to show you probably tomorrow. If you haven't seen them Elzybells is having her Summer Release today... so click on my link and go and check it out they are adorable. 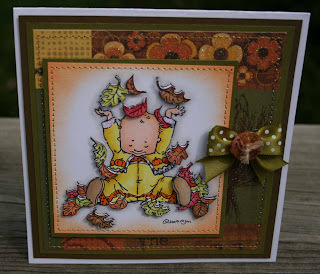 Here is a Whiff of Joy card I made using the Elisabeth Bell latest release. She has for preorder her next stamp kit too. I believe you have till August 7th to preorder it. This card is colored with markers. Have a great weekend.. 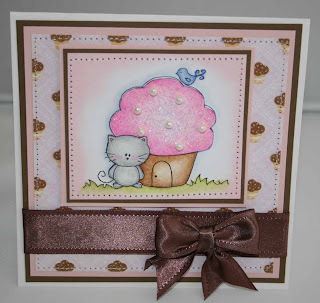 Here is this weeks card for Soft Pencil. Don't you just love the image. This one was so much fun to do. 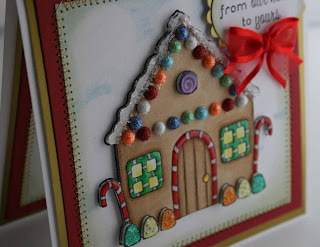 Our challenge for this week was stitching well not a challenge for me if you know my work you know I stitch all my cards. So to be different I stitched the stem of the card. If you click on the pictures you can enlarge them and see what I am talking about. 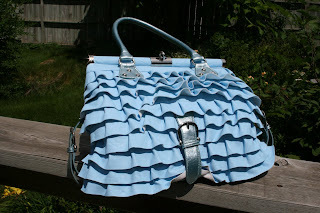 I did this on my sewing machine. Someone asked in a previous comment on how I get my stitching straight. Nothing hidden I have been just doing it for so long maybe is how they come that way but I do use a medium size Janome sewing machine and have no problems keeping it on the straight and narrow. Ok back to the card. 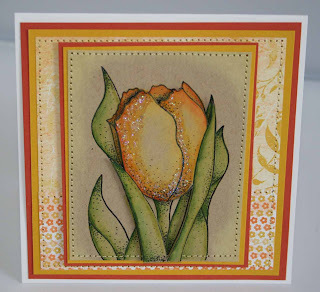 Card is colored with Copics and then I added Smooch to the flower to make it metallicy. 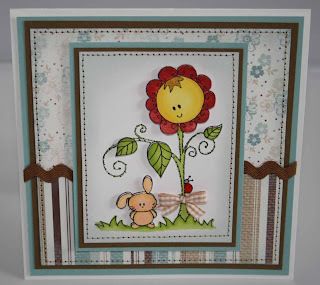 Cardstock and Paper is Stampin Up. The kitty and flower are 3d also. I know Christmas cards already... This card was colored with copics. 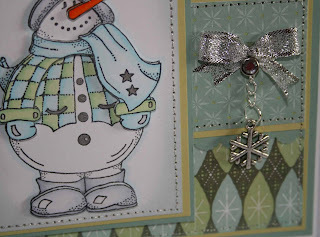 Added chunky glitter for the snow and some chain and a charm and brad. Lots of goodies on this one. 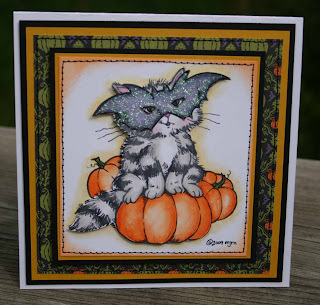 Here is another stamp by Rachelle Ann Miller - Isn't this one too cute. Yeh it is kinda of early to be thinking about Christmas but they do say Christmas in July. Paper I had in my stash and not much coloring with this one a few copic scribbles is all. 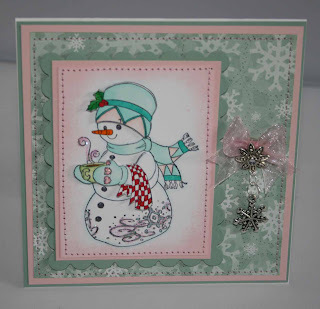 Here is a card I did with I believe it is Rachelle Ann Miller stamps. I tell you I have so many stamps I can't keep them all straight these days. I hope everyone is enjoying the nice warm weather. We have been having great weather. Today I am going to relax outside and read the last book in the Christine Feehan Drake Sister series. And do nothing else but relax. 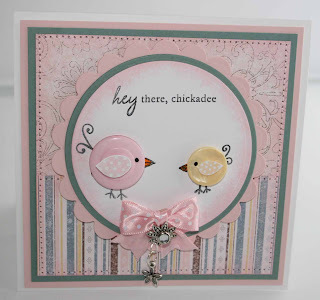 Card is colored with markers - The saying is from CD stamps. 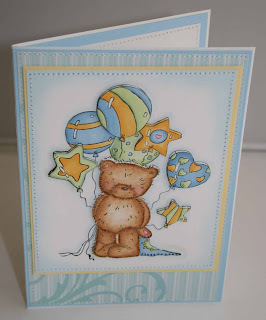 Here is another card I made using the Popcorn Bear from Bunny Zoe's store. As you can see like I said they are pretty big. This card is 5 x 7... They are adorable though. Baloons are colored in Copics and Bear in Prisma's.. Isn't this little bear just the cutest ever. I bought a bunch of these when they were on preorder from Bunny Zoe's internet store. 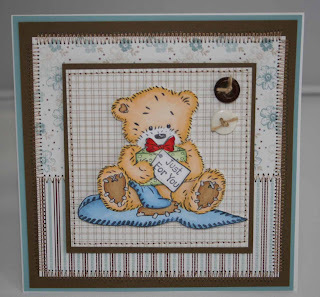 They are from Crafter's Companion and they are all called Popcorn the Bear. They are alot bigger then I thought they would be. Majority of them you would want on a 5 x 7 card and there are only a couple that fit on the square cards. They would not fit on a regular A2. They are definately very nice though and they are red rubber which I prefer over acrylic. 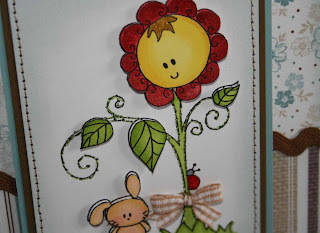 This little guy is colored in markers and paper is stampin up's last year. Hope everyone is having a fabulous fourth. It is down pouring here LOL and I have to work tonight fun stuff... 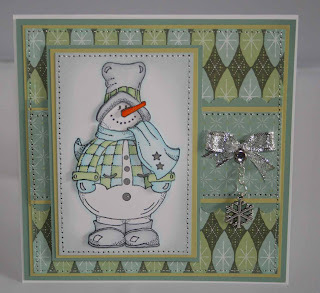 Here is a card I made using my Whiff of Joy stamps from Elizabeth. Colored with some markers and pencils. 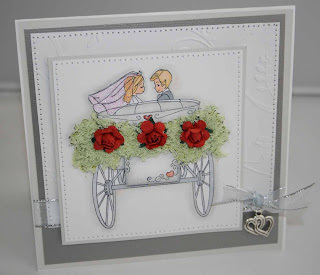 I used flower soft on the back and had some roses I believed are Darice. Isn't this kitty too precious. It is another one of the Digi stamps from Soft Pencil. I colored this with pencils and OMS. 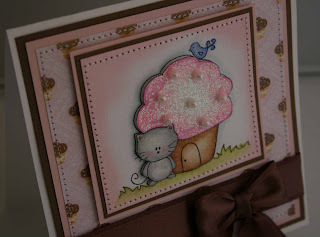 I added stickles to the cupcake and glued on pearl beads. 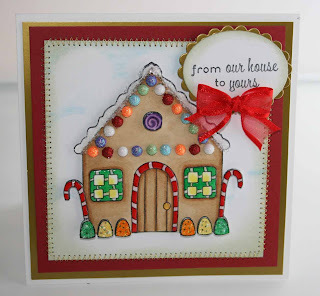 The paper is from DCWV sweet stack and the ribbon was last years Christmas Stampin Up ribbon. I hope everyone has a fabulous 4th weekend. I am working but I have been enjoying this lovely weather. 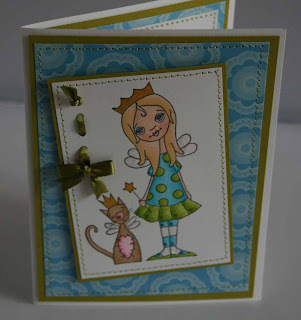 I haven't really felt much like making cards but still making a few here and there. Have a happy 4th.... Almost forgot the Gorjuss Girls Set 3 are in. I ordered mine last night... Along with a few others I have been wanting. My husband has been getting into Rockband lately must be a guy thing but they have the cutest stamps with a teenage boy playing a drum set and one of him playing a guitar so I needed both of them. 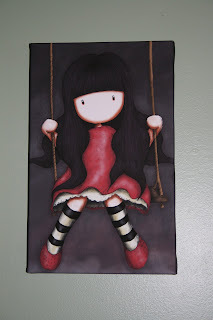 haha... Then I got one of Diana Duda which I would like some more of hers in the future. 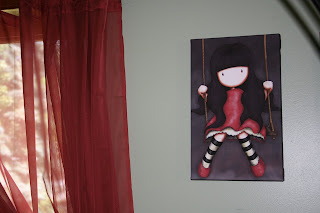 I love looking at her Etsy site one of these days I am gonna get to it when her originals are in stock LOL.... Have a great Friday.